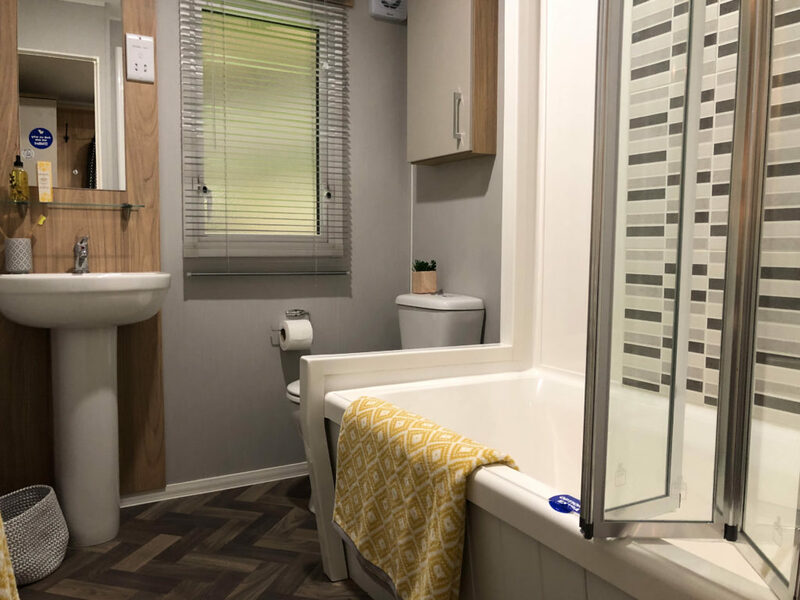 There are not that many static caravans that will comfortably sleep six and still accommodate them space-wise during the daytime but the Willerby Castleton does. 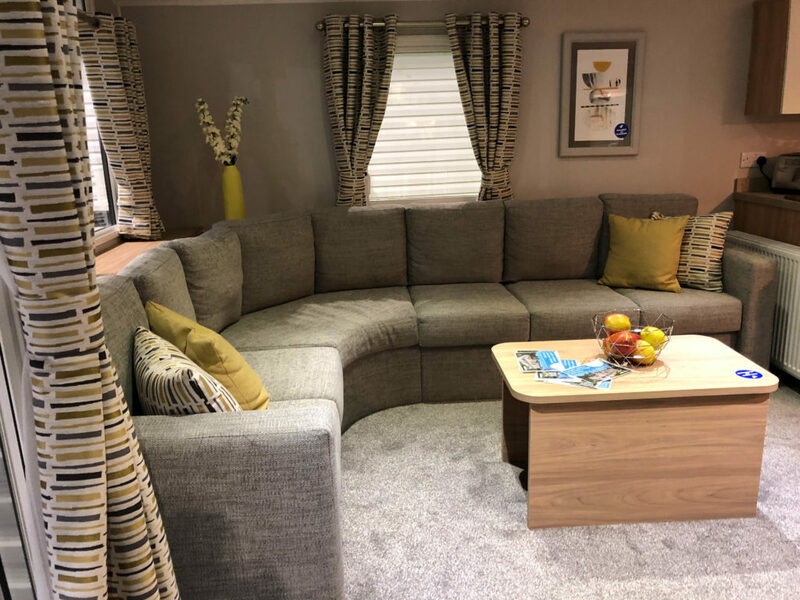 The residential sized L-shaped settee in the lounge also doubles as a pull-out sofa bed, but what is clever is that even when in ‘night mode’ there’s still plenty of room in the front of the Castleton. The lounge can have a side opening sliding door, if fitted as an option, but has a UPVC door offset to allow entry from the front. The giant settee focuses the attention towards the fireplace and TV point, allowing the entire family to enjoy the evening entertainment without twisting your necks! Cooking isn’t a chore in the Castleton either as not only is there plenty of counter-top space but the ergonomic layout of the units means that someone can be washing up and not interfering with the person cooking. The hob is a four burner, sitting above the oven and grill with a yellow splash back. In the multi-tone grey fabric scheme of the lounge and kitchen, the yellow is a welcome splash of colour. You can also have an integrated dishwasher fitted if washing up isn’t for you! 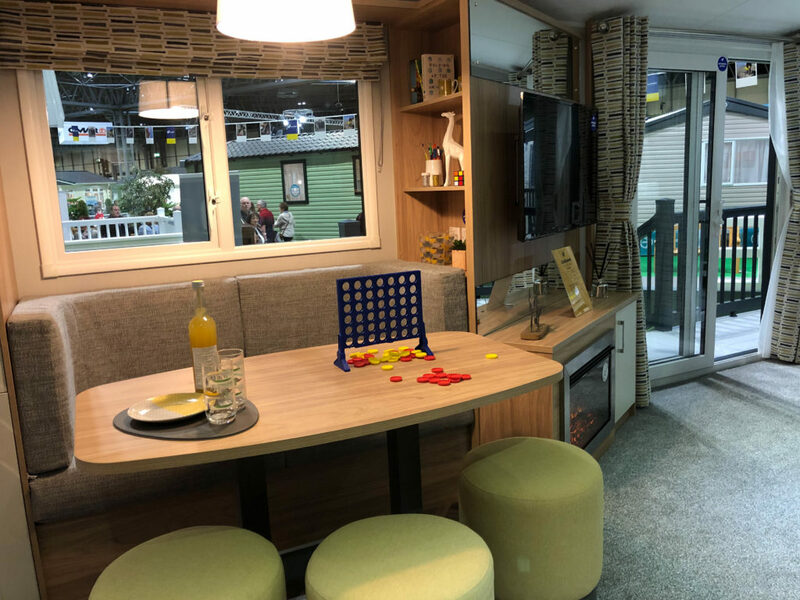 Opposite the kitchen is the dining table, come breakfast bar, with a sofa style seat against the wall and three stools on the other side of the table – perfect for those with young children. The front of the Castleton is a great open-plan layout, nothing seems in the way or superfluous and you can easily imagine a family living here, with plenty of space for everyone. Moving towards the back of the holiday home, the second bathroom is on your immediate left. This one was fitted with the full-bath option. Even with this large unit there’s still plenty of space for all types of ablutions, it also features a tiled wall next to the bath, adding to the style of this grey modern interior. The second bedroom continues the theme of spaciousness, even though the beds are domestic-size 3ft wide models. It features a wardrobe, plus shelving, that can be upgraded to include a TV aerial point, great to keep the kids entertained in their own space. At the back of the Castleton is the master bedroom, which, given that the unit is only 12 feet across looks massive. There’s touch sensitive bedside lighting and bedside USB points for all your charging needs, plus mirrored dressing area! The bed also comes with a choice of mattresses so you don’t just get the ‘standard’ you can get the type that works best for you. Plus it lifts up for that extra storage space. Attached to this rear bedroom is an en-suite washroom, with a shower and everything else you’d expect. 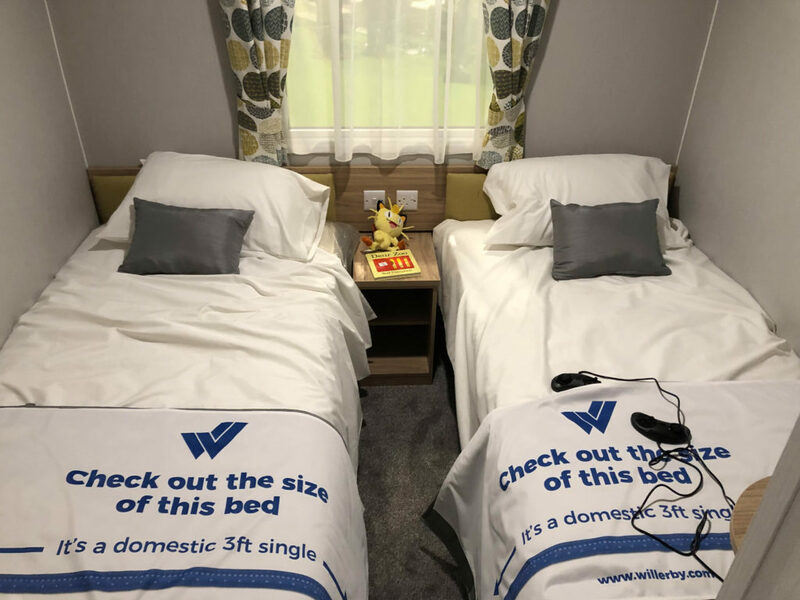 Willerby have done a great job at making the Castleton personalisable, you can spec it just the way you want without any un-needed excess. There are optional extras available for the Castleton but you can pick which ones you want and which you don’t need, very useful to not have to just buy an ‘extras pack’. Verdict: Good layout, well-priced family holiday home for those that enjoy having friends over and entertaining. The kids bedroom can be their own haven, whilst the lounge has a spacious and relaxing feel. Plus: This static caravan sleeps six. The lounge and kitchen are large enough that you would never have to worry about space or where you and guests could sit. Great for families. Minus: Although the Castleton looks and feels very good value, there’s a long optional extras list so do remember to price these in when looking. Small en-suite washroom. 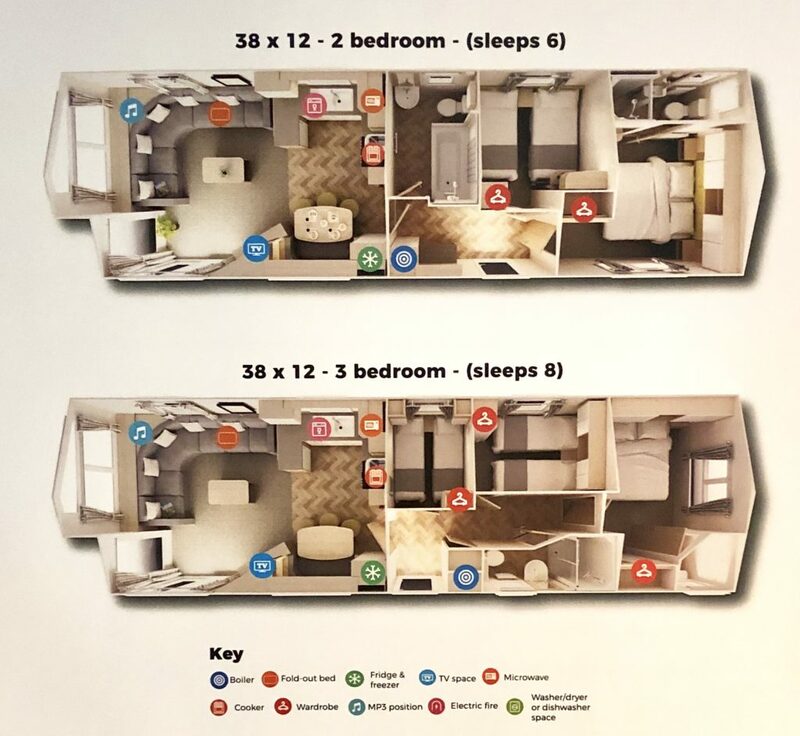 In-a-nutshell: Great value family static caravan with a very usable layout. 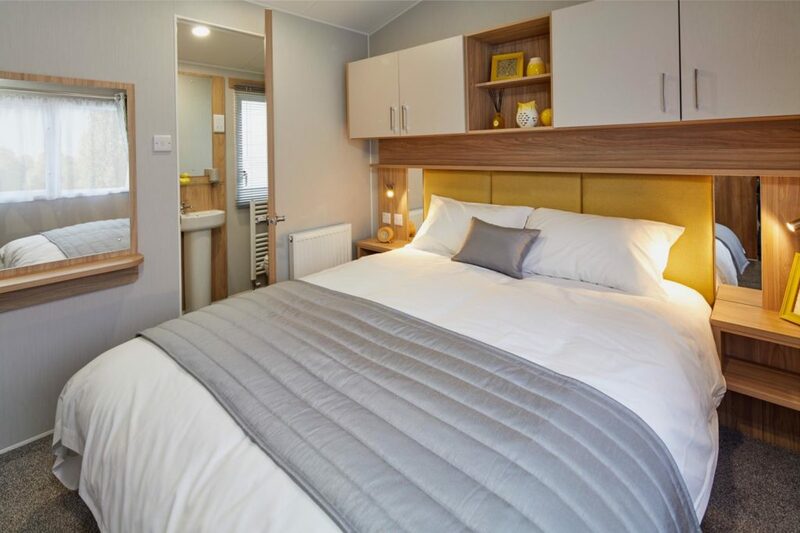 Key optional extras: Gas central heating system featuring high-efficiency condensing combi boiler (£1,830), double sliding patio doors (£590), integrated washer/dryer (£675.00), Simply Pawsome dog pack (£555.00). 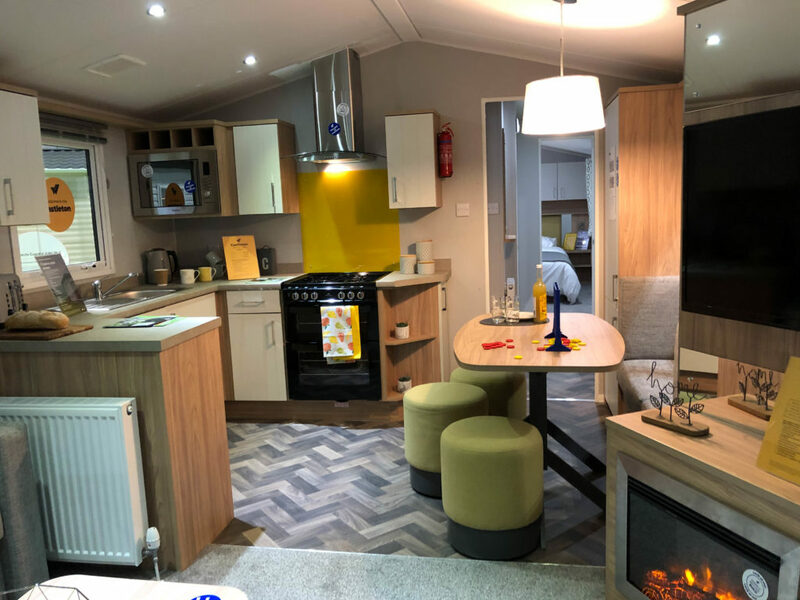 If you’re looking to buy this holiday caravan why not get a great value insurance quote from us today. Click here to get your static caravan insurance quote. 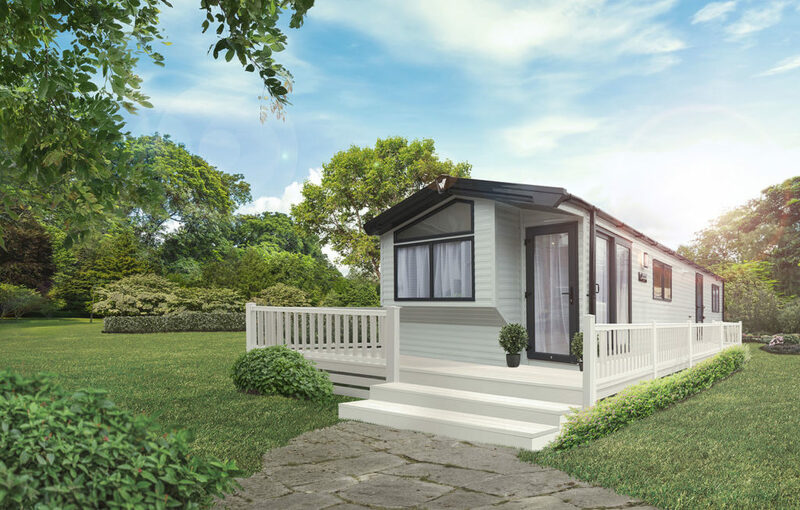 For more information about the Willerby holiday caravan range visit www.willerby.com. Hi Bryan, it’s difficult to provide a quote as it depends on the park location and overall sums insured. Hi Helen, if you call our contact centre on 01422 396770 they will be able to help.